Grand White Jelly Bean to the Rescue! KC recently lost her job and shared that she has a fear of moving forward. I felt there was a FEAR of the “unknown” KC confirmed that that felt correct. KC wants to have clarity and be inspired as to which direction to take and to have peace within as she moves forward. 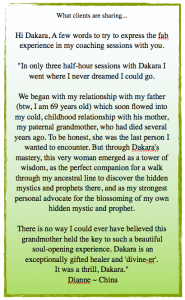 When tuning into KC’s energy field I felt that an ancestor’s energy was interfering. I guided KC to tune into her ancestral lines. KC observed energy on her Mothers side, a female figure that was several generations back. KC felt a lot of anger energy rating the energy at a 10 (on scale of 1-10, 1 being low and 10 high). We asked the ancestor what she needed for healing and she simply stated “Love”. We called forth the energy of unconditional love to KC’s higher self point. The love energy was filled with a yummy soft pink that had silver sparkles radiating through out. We brought the energy down through the points and into KC’s heart center allowing her heart to feel the fullness of this unconditional love, then we directed the energy from KC’s heart down to the ancestor. KC could see and feel the ‘anger’ melting away, this dropped the rating from a 10 to a 2. When we asked about what made it a two, I felt an interfering energy present that felt it needed to protect this ancestor and all the women in this line, KC confirmed that she felt the interfering energy. We simply sent more love to the interfering energy and commanded it to leave. It did so promptly. This dropped the energy to a 1. KC then took the HPT pose and we asked “What part of me is knowingly or unknowingly is allowing this energy of fear of the unknown to live in my being?” KC heard “Poor Me”. Victim energy filled her stomach area with a rating of 8. KC asked her third chakra what it needed for healing and was shown a white jelly bean and a red heart shape with a popping sound. KC laughed and though the images were funny and unusual. I shared with her that it doesn’t really matter what the images are as long as the represent what is needed to shift and heal. We called forth the grand white jelly bean and red heart energy, hearing it pop like popcorn as we brought this healing light down into KC’s heart and the spotlighted the energy into her stomach. After KC took a deep breath the energy had shifted to a zero! KC giggled at the huge shift that happened with a jelly bean and a heart image. Laughter is truly good medicine. To assist KC further in having clarity around her next step, I guided KC to connect with her Souls Hearts Desire. We set an intention to find an un-manifested desire in the heart of KC’s soul. KC saw the word “teach” and she saw a “forest of trees”. This information did not make sense to KC, when we asked for more information through Dominate/Non Dominate hand writing about the symbols, KC was shown what she truly wants is “love and freedom”. KC held the HPT pose and we brought down the energy of “freedom and love”. She felt a sense of being very grounded, at peace and that the past was gone. KC felt all the anger was gone, the fear of the unknown was gone and she felt ready to take the next step on her journey. KC also felt open to different career ideas than she did before the session. All of KC’s ratings were at a zero by the end of the healing. What a blessing! DaKara Kies is a gifted Intuitive Master Healer & Sacred Light Alchemist that specializes in clearing core issues, energy blocks so you can step into your true purpose, power and passion. BE the YOU, you are meant to BE! Receive YOUR Sacred Transformation now!